Cha Tekeli, Inspiring people to settle for extraordinary. To show up & bring it. To fail big & laugh about it. To love your ugly imperfections. To rediscover your mojo. Imagine if at the end of the day, you were able to read a board with all the thoughts that went through your mind. What would it read? Did you wake up this morning, look in the mirror and think, “Wow, I am aging wonderfully”? When you began to consider the day ahead, did you have thoughts like, “This is going to be the best day. I can’t wait!”? When you turned on your computer and found your internet was down, did you think, “Perfect. This is an opportunity for me to do some writing”? You get the idea. Chances are you weren’t all that kind in your mind. In fact, sometimes you were brutal. If you start your day in your head, you are fighting an uphill battle. You’ll find yourself combating negative thoughts, dealing with patterned emotions that keep you stuck, and using up precious energy before you get out the door. That’s a real problem because all of us have a limited amount of energy. Think of it in terms of energy pellets. If you start each day with 20 energy pellets and use eight of them before you leave the house, you are starting at a big disadvantage. This is what happens when you drain yourself with negative thoughts. Your energy pellets are neutral. Your thoughts, feelings and actions determine if those pellets are turned into positive, good energy that helps you feel vibrant throughout the day, or negative energy that leaves you tapped out before the day is over. People who design their lives to utilize their mental energies effectively start their days differently than those who don’t. It’s not as difficult as you may believe. It’s just a matter of understanding that in order to get out of your head — which tends to go to your pre-programmed mindset and inner voice of judgment — you first need to stimulate and activate your body and your senses. 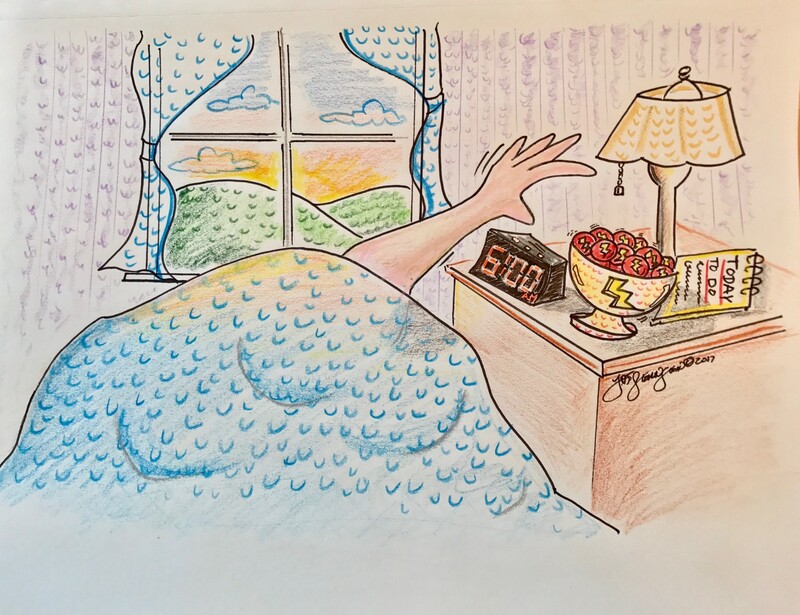 As an Executive Coach, I hear a lot of “I’m not a morning person” when discussing the concept of energy pellets. It’s like a hard stop, deadweight position. “No, seriously, I’m not a morning person.” And with that, you’re explaining why you can’t do things like work out first thing in the morning. Or why you can’t wake up earlier to begin something “you really want to.” Or how no one should talk to you before your first cup of coffee. If you recognize yourself in there at all, know that you’re not alone. And while it may sound unrealistic, you’re not condemned to a life of tough mornings or a series of Groundhog Days, where you’re doing the same things day in and day out. There are simple ways to combat this habit of waking up and jumping right into your head. You can start as soon as you wake up, before you even get out of bed. Use your physical body to your advantage. Do some gentle body movements and massage while you’re lying down. Make circles with your wrists and ankles; open and close your hands and massage your fingers; gently pull your hand away from your wrist and massage the palm in the wrist crease, directly under your pinky and two inches above the wrist. These are wonderful acupuncture points that stimulate your heart and keep you out of your head. Stretch your entire body, bring your knees into your chest and roll on your spine side to side, waking up your spinal fluid. This is more than a series of stretching exercises. You’re invigorating your body’s circulation and creating space in your body. You hear this a lot in yoga but you don’t even have to sit up to do this. Taking five minutes to start the day by invigorating your physical self can really change the way you feel before you even get out of bed. Consider which of your senses affects you most. Everything for me comes back to music so I start every day listening to a playlist of mantras that soothes me. Healing vibrations of music can energize the body and encode it with positivity. It’s like tuning an instrument … and isn’t that what your body is, anyway? Create playlists that work for you and elevate your mood. It’s not about “waking your body up” as much as nurturing it with positive tones and frequencies. After you wake up, take a cold shower. I learned about this in Kundalini yoga. It’s called Ishnaan or hydrotherapy. Cold showers open up the capillaries and get the body organs flushed. There’s much science behind its benefits. You can read more about it here: Scientific Evidence-Based Effects of Hydrotherapy on Various Systems of the Body. Your mind/ego may not like it, but your body will. If it sounds too hard to take a cold shower first thing in the morning, work your way up to it. Like any good habit, start a little at a time and build it with consistency. Start with lukewarm water and end with cool water, increasing the amount of cold water each week. What’s amazing is the sensation you feel when you step out: warm. Next, stimulate your palate. Make yourself something delicious to eat. It’s not as difficult as you may think. Plan ahead for the week. Have all the ingredients you need to make a nourishing breakfast: coconut oil, butter, eggs, cheese and vegetables you can microwave; or make a smoothie with almond milk, spinach, kale, ginger, avocado and blueberries or strawberries. The options are limitless. If your tummy is happy, you will be too. My mother is one of the happiest morning people I know. When she wakes up, she sprays a little Turkish kolonya on her hands and by her nose because she loves the smell and sensation that it creates. Smells like lavender can trigger endorphins and positive emotions. It’s important to note that smell is the sense most closely linked with memories and emotions, so if you choose this method, make sure you select a smell that stimulates happy thoughts. One of my favorite things to do in the morning is to lie on the floor with my cats and play with them. It feels soothing and calming to spend time with your animals. You’ll feel the mood-boosting benefits that accompany interaction with your pets. These feelings create positivity in your body as well as your mind. When you go to sleep tonight, see your tomorrow as a clean slate, because it is. Start your day using your energy pellets consciously, through your body and your senses. This is a great first step to help break the cycle of doing the same things the same way over and over and holding yourself back in the process. Even small changes can help you experience life differently.